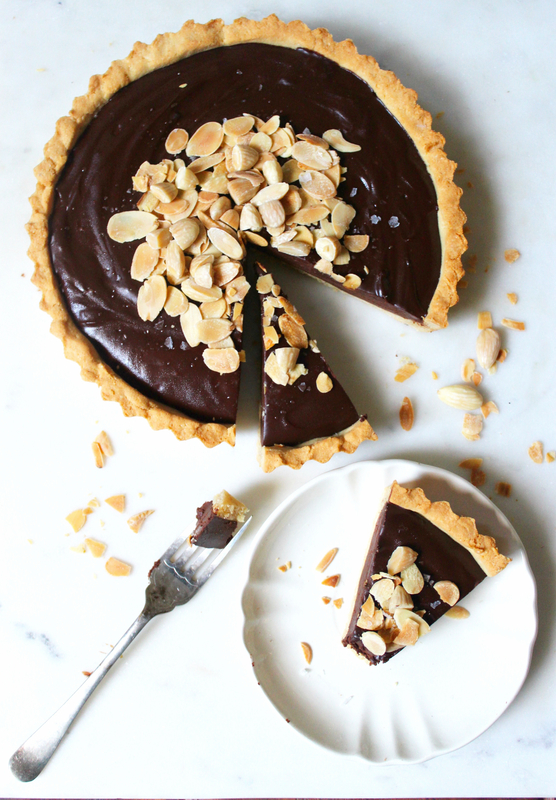 This Dark Chocolate Almond Tart is the tart to end all tarts. It’s every chocoholic’s dream and it’s my go-to for all of our celebrations. The filling is so smooth and rich, it’s absolute heaven with the crumbly crust. Combine all of the crust ingredients in a large bowl and mix well. It should be a crumbly mixture. Grease an 8 inch tart tin with a little coconut oil. Press the crust mixture tightly into the tin and up the sides. Bake at 180’C for about 15 minutes, until lightly golden. Don’t worry if it puffs up a little, it will fall as it cools. Leave the crust to cool. Spread the flaked almonds out on a baking sheet and bake at 180’C for 12-15 minutes until golden. Scoop the coconut cream from a chilled can of coconut milk (keep the water for something else). Add all of the filling ingredients to a large saucepan on medium-low heat. Whisk until melted. You will have an irresistible thick, glossy mixture. Pop it in the fridge for 1-2 hours to set. 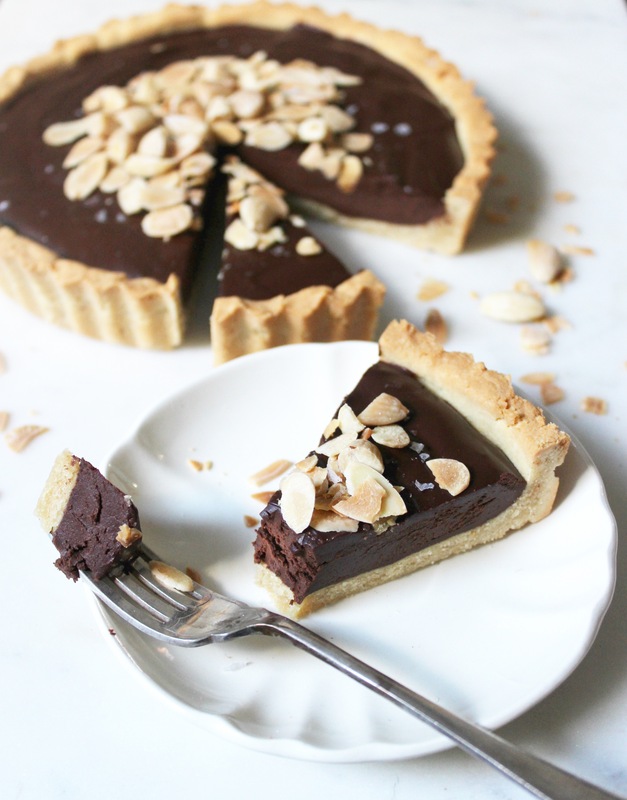 When the tart is set, decorate with flaked almonds and serve. I love any dessert made with coconut cream. This looks delicious! Can you use white or milk chocolate? Made this tart on Saturday . If you love chocolate then this is a must . It will go a long way as it is heavy but deicous . this tart is perfect! love the chocolate and almond flavour too. i can imagine it was so delicious. I know you say it’s for an 8-inch tart tin, but just wondering what depth this should be? I’m going to buy a tin especially for this! Could I use golden syrup or honey instead of maple syrup?